There’s no need for it to be hard to find a locksmith in Harlow. In fact, it can be extremely easy and straightforward. All you need to do is contact Access Denied. With a large team of professionals and a great deal of knowledge, we’re able to provide a locksmith in Harlow for your every lock need. We know that finding and trusting a locksmith can be daunting, as it’s difficult to know who to pick and whether you’re making a good decision. You may not have had to use a locksmith service before. That’s why we aim to make everything as simple as possible. At Access Denied, we are able to provide an extremely high quality of service. Thanks to our large team of skilled individuals, we’re confident in our ability to provide an unmatched service. We focus on professionalism and quality, but also take into consideration the need for a quick service. Though many of our competitors provide one or two locksmith services, we go above and beyond. Rather than focusing on one area of the locksmith industry, we offer services for both vehicles and properties. This means you can use the same locksmith in Harlow for all of you locksmith needs. Whether you’re locked out of home or you’ve lost your car key, you can count on us. You never know when a problem with occur with a lock or a key, which is why it’s important to have a locksmith in Harlow on standby. This way, whenever something happens, you know who to call. 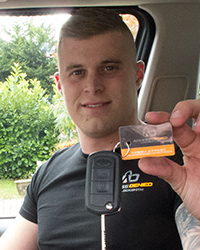 Our services include replacing lost keys, replacing damaged keys, gaining entry into vehicles, gaining entry into properties, retrieving keys that have been locked inside and fitting new locks. We’re even able to assist with replacement locks and issuing spare keys. In short, Access Denied provide a full service. As professional locksmiths, the entire Access Denied team works hard to provide efficiency and effectiveness at all times. After all, what’s the point in using a mobile service if it’s not quick? The fact that we’re mobile means we can come to you at any time, there’s never any need for you to come to us. Whether you find yourself locked out of home in the middle of the night or without a car key when you’re trying to leave work, we have a locksmith in Harlow who can help. If there’s one thing we know a lot about, its being locked out in Harlow. Most people have done it and if you haven’t, you probably will at some point. Being locked out is extremely easy and it happens to most people at one point or another. However, do you know what to do? Simply, you need to contact a locksmith in Harlow. If you ever find yourself locked out in Harlow or the surrounding areas, we can help. At Access Denied we have a large team of professionals on standby at all times; this means we’re able to provide a fantastic service at any time, on any day. As you can never be too sure when you’ll be locked out, we like to make sure we’re always available to hep. Whether you’re locked out of your car or a property, get in touch with Access Denied. At Access Denied, we truly know how stressful and annoying being locked out can be. If you’re locked out of your car, your entire day can be thrown into chaos. Think about it, without access to the car and no way to fix the problem, you won’t be driving anywhere. In the same way, being locked out of home means you’re pretty restricted until you’re able to get back in. Of course, those with a spare key are lucky. However, if you don’t have a spare key, you’ll need our help. As a professional locksmith in Harlow, we work quickly to help you get back into your car or vehicle. Wherever you are and whatever the problem, we’ll be there as soon as possible to help. This could mean using specialist equipment to get into a car or using our professional means of opening a door. Either way, we’re able to do it quickly. Then, we’ll be able to provide you with a replacement key to ensure the problem doesn’t happen again. At Access Denied, we’re confident in our ability to provide an unmatched service to those who are locked out in Harlow. Whatever the problem, we have a locksmith in Harlow who can help. There are a number of reasons as to why you may need a lock replacement in Harlow. Thankfully, you have come to the right place. At Access Denied we have been offering lock replacement services for a number of years and as a locksmith in Harlow, we’ve solidified ourselves as being one of the best. This means that, regardless of why you need a lock replacement or the type of lock replacement you need, you can count on us. With Access Denied, you are guaranteed a top service every single time. Lock replacement services come in all different shapes and sizes, and we also personalise our service to you. Maybe you’ve lost a key and you want to replace the locks for safety reasons, or perhaps you just want to upgrade your locks into those that are more secure. Whatever the reason, you can count on the team here at Access Denied. Through our years of experience as being an expert locksmith service, we have gained a great understanding of the level of skill and professionalism that goes into providing a great lock replacement service. We know that needing a lock replacement can cause stress, especially as a lot of people assume it to be a bit of a hassle. However, this isn’t the case. When you use Access Denied for your lock replacement in Harlow, you can enjoy an efficient service. Instead of taking our time, we’ll have you set up with new locks in no time. Our ability to offer an efficient service doesn’t mean we compromise on the quality; these are two things that we believe can go hand in hand. As well as working quickly, we also work professionally. Therefore, not only are you guaranteed a fantastic service, but you don’t have to worry about the time the replacement will take. Simply, it’ll be done as soon as possible. If you have a question about lock replacement in Harlow or you want to know more about how the lock replacement process works, contact us. By getting in touch with a member of the Access Denied team, all of your questions can be answered. You may have never thought about what would happen if your key was to snap. After all, surely it isn’t a problem that many people are faced with? Surprisingly, snapping a key isn’t uncommon at all and it happens to a lot of people. Both car keys and house keys can snap, but do you know what to do? If you find yourself with a key snapped in Harlow, we can help. At Access Denied we have the level of experience and skill needed to help those with snapped keys. Whether it’s a vehicle key or a property key, we’ll have you set up with a solution in no time. At Access Denied, we pride ourselves on offering a full range of locksmith services. This includes issuing replacement keys, gaining access to a property when you’re locked out and retrieving keys from inside a vehicle. This full range of locksmith services also extends to include snapped keys. As a professional locksmith in Harlow, we believe it is our duty to ensure you can rely on us for anything. When a key snaps, it can cause huge problems. Regardless of how or why the key has ended up being snapped, you’re sure to find yourself struggling. Think about it, with a snapped key there is no way you’re able to drive from A to B; this is a problem if you have work, kids or places to be. Similarly, with a snapped key there is no way you’re able to get into your home. If you’re someone who has a spare key, you’ll be able to use that. However, a lot of our customers do not have a spare key and that is where we step in. The team at Access Denied are able to issue replacement keys and spare keys at a moment’s notice. Regardless of key type or car model, it won’t take us long to solve the problem. Whether it’s a key snapped in Harlow or you have another need for a locksmith in Harlow, we’re always available to help. For more information on finding a locksmith, get in touch. Call us today on 07534 277020 for a no obligation quote or for more information on any of our services. Alternatively, get in touch online. This is not a problem and is the most common reason we get calls. Our non-destructive methods of entry mean we can open your car in no time at all. Call us now for a call out in as little as 30 minutes by one of our Harlow Locksmiths. Access Denied Harlow Auto Locksmiths can provide new keys for your car created to the highest of standards again within as little as 30 minutes. Access Denied have trained staff working all over Harlow meaning a member of the team of Auto Locksmiths is always within 30 minutes of reaching someone when they call. We will never make you wait longer than necessary to help you out. Access Denied is prided on having staff locally in and around Harlow 24/7. This means we have a rapid response time if you ever feel like your stuck. Give us a call now to discuss you needs. When you are locked out of your vehicle, your home or your work place, time is of the essence. That’s what makes Harlow Locksmiths the number one choice for a locksmith in Harlow. Our local presence means we can respond to customers quickly and efficiently, providing the skills and expertise to cover a wide range of requirements. Whether you have lost your keys entirely, or misplaced them, we understand the importance of you solving the problem and resuming your day. Regardless of if you are at work, at home or on the road, the Harlow Locksmiths team comes straight to you, not only providing you with a new set of keys but also a set of replacements in double quick time. We protect you from individuals attempting to gain unauthorised access by refitting your lock if necessary, ensuring your old keys will not work, whichever hands they fall into. Complications with keys and locks – such as damage, loss or theft – can happen at any time of the day or night. For this reason, Harlow Locksmiths provides a 24/7 offering, meaning if you require a locksmith near Harlow or in the town itself, we will be at your service in no time at all. Our friendly team of customer advisors are accustomed to dealing with all kinds of scenarios and will be able to advise you on the best and most secure way forward. We are the locksmith Harlow has been waiting for, with a policy of no call out fees, and only charging for the labour and parts we provide. With Harlow Locksmiths, what you see is what you get – that means no hidden add-ons, and an assurance that what we quote you over the phone is the price you will pay. All the work we carry out comes with a year long guarantee, and in the event that any issues do pop up, we will address them immediately. If you live in the CM18, CM20, CM19 or CM17 areas, Harlow Locksmiths are your go-to service for all manner of key and lock repairs and replacements.